Engraving by Robert Anderson based on 1848 daguerreotype. In dying under such mysterious circumstances, the father of the detective story has left us with a real-life mystery which Poe scholars, medical professionals, and others have been trying to solve for over 150 years." "[The passing of Bierce was] terribly beautiful and fitting [and the mystery of his disappearance a] tragically appropriate conclusion to a life of erratic adventure and high endeavor" (pp. 49-50). Both Edgar Allan Poe and Ambrose Bierce wrote stories with—as Poe noted in "The Philosophy of Composition"—the "consideration of a novel effect … a vivid effect" on the reader as a central goal. Ironically perhaps, the lives and especially the deaths of Poe and Bierce have also had a vivid effect on readers, spawning a cottage industry of theories and biographies, some of questionable reliability. We are, naturally, curious about the authors and the mysterious demises that seem to some observers "tragically appropriate" to their lives and art; biographical and first-hand accounts of Poe and Bierce are undeniably fascinating. But do they—should they—add in any way to our understanding or appreciation of their work? Can we really know the truth about Poe and Bierce? How can we gain insight into how they created? The stories of Poe and Bierce, far from being autobiographical confessions, are works of art deliberately and carefully crafted to evoke a response in readers. Such conscious crafting must make us wonder about the relevance and significance of details about their lives—whether mundane or intriguing—to our understanding of their work. Note: This lesson may be taught either as a stand-alone lesson or as a sequel to the complementary EDSITEment lesson Ambrose Bierce, Edgar Allan Poe, and the Unreliable Narrator; although designed for a younger audience (grades 6–8), many of the activities and resources in Ambrose Bierce, Edgar Allan Poe, and the Unreliable Narrator can be adapted for high school students as well. CCSS.ELA-LITERACY.CCRA.R.8. Delineate and evaluate the argument and specific claims in a text, including the validity of the reasoning as well as the relevance and sufficiency of the evidence. CCSS.ELA-LITERACY.CCRA.W.9. Draw evidence from literary or informational texts to support analysis, reflection, and research. In the course of this lesson, students will search out inconsistencies in at least four Poe biographies. How can such inaccuracies occur? In the case of Poe, there are two central reasons. First, Poe himself had fabricated some stories about his life, such as the tale of his journey to Greece to fight in a revolution. But perhaps the largest source of misinformation was Rufus Wilmot Griswold (1815–1857), who acted as Poe's literary executor—though it is far from certain that he had the right to do so. Griswold's biography of Poe, while making its author money, is tainted by his apparent hatred of Poe. Through some less-than-ethical arrangements with Maria Clemm, Poe's mother-in-law, he [Griswold] secured the rights to publish a posthumous collection of Poe's works. (Technically, the rights to Poe's estate belonged to his sister Rosalie. Mrs. Clemm, unaware of his deep hostility towards Edgar, may have first approached Griswold.) The initial two volumes appeared towards the end of 1849, with a brief preface pronouncing the edition as a charitable act to benefit Mrs. Clemm. In actuality, instead of the promised money, Mrs. Clemm received six sets of the two volumes to sell at whatever she could get. Griswold even kept all of the manuscript material Mrs. Clemm had sent to him, all worth far more than one-hundred sets would have been. It was long claimed that Poe himself had appointed Griswold his literary executor, but no real evidence of this has ever been produced. … In this "Memoir" Griswold cleverly manipulated and invented details of Poe's life for the least favorable account he could create. He even forged letters from Poe to exaggerate his own role as Poe's benefactor and to alienate Poe's friends. (A. H. Quinn provides an exacting account of these forgeries in his 1941 biography of Poe.) No lie was too great for Griswold, no slander too outrageous. Poe's choice not to return to the University of Virginia became expulsion for wild and reckless behavior. Poe's honorable discharge from the army became desertion. The 1827 publication of Tamerlane and Other Poems was dismissed as a lie. He even accused Poe of engaging in some dark secret with the second Mrs. Allan and invented a scheme by which Poe supposedly blackmailed an unidentified "literary woman of South Carolina" (presumably Mrs. Ellet). By praising Poe's writings and attacking Poe's character, Griswold managed to make himself appear to be a sincere admirer and to attain a false sense of fairness in his general approach to Poe. In short, it was a brilliant piece of character assassination. Poe's literary executor had become his literary executioner. Was Poe drunk when he was found on the street in Baltimore on October 3, 1849? Dr. J. Evans Snodgrass, the man who sent Poe to the hospital in a carriage, said in 1856 and 1867 that Poe was indeed intoxicated. Dr. John J. Moran, however, Poe's attending physician for the final few days of his life, insisted in 1875 and 1883 that Poe had no trace of alcohol in his system and had probably been beaten by thugs. … Moran has the advantage of having spent more time examining Poe, but he has partially discredited himself by leaving us at least three romanticized and somewhat contradictory accounts. Snodgrass, having left a more coherent account, has generally been accepted by biographers, but he was a radical temperance man and saw in Poe's death a means of persuading others to abandon alcohol entirely. "A Few Words on Etiquette"
Activity 1 will work most effectively if students do not know that the pieces are all from the same author. To make a living as a writer, Poe had to keep in mind what would sell; he created a surprising variety of pieces. The selections above epitomize that variety in subject, tone, and style; the same variety should be apparent in the resulting psychological profiles. Enjoy comparing them; don't take them too seriously. Let the activity demonstrate the danger of equating the work (and especially the narrator) with the author. Some students may have preconceived notions about Poe (as mad, as a drunkard). Obscure Poe's name before duplicating and distributing materials. The selections, most of which are little known, offer a variety of genres and difficulty. Though varying in length, none of the pieces is exceedingly long; some are very short. If possible, make the reading a homework assignment so students can devote whatever time is needed. Allow a short time in class the next day for students to review. In Actvity 3, an exercise involving the short story "The Tell-Tale Heart" and a personal letter of Poe's is repeated in the complementary lesson Edgar Allan Poe, Ambrose Bierce, and the Unreliable Narrator. The Ambrose Bierce activity (Activity 6) is optional. It provides a sequel to the Bierce material in the companion lesson Edgar Allan Poe, Ambrose Bierce, and the Unreliable Narrator and enables interested classes to practice their literary sleuthing after having read some of Bierce's work. Activity 1. Do You Know the Author If You Know the Work? Assign the reading of one of the following works of Poe to individuals or small groups based on your knowledge of your students (and without identifying the author). Ask students to consider what kind of person is likely to have written each; tell them they will be creating psychological portraits of the "authors." to create an alphabetic representation (ENTP, for example) of "their" author's personality. Compare student profiles and solicit evidence from the texts that influenced student choices before revealing Poe as the author of all the selections. What did the students already know about Poe? What's surprising about the selections? If we know the writing, do we know the author? What effect would knowing Poe was the author have had on the students' reading? Would it have made it more difficult to read any piece objectively? If desired, take this opportunity to share with students a short biography of Poe. Activity 2. Poe: How Reliable Are the Biographers? Divide the class into groups of four students each. Download, copy, and distribute the chart "Unreliable Biographers" on page 1 of the PDF. First, all group members should read the brief biography Edgar Allan Poe on The Sesquicentennial of the DEATH OF EDGAR ALLAN POE, a link from the EDSITEment resource American Studies at the University of Virginia. Using key words from the chart questions, and dividing the tasks among group members, students should skim the other three biographies for answers to the questions. Directions are provided on the chart. What did students learn about the reliability of the biographies? Poe's posthumous reputation sustained grievous and long-lasting damage from a libelous biography by Rufus Griswold, whom Poe himself had appointed his literary executor, and rumors, mostly unfounded, circulate to this day about Poe's mental state and personal habits. Poe's famous tales of the grotesque made it easy to believe Griswold, easy for readers to associate Poe with his mad characters. Is that a useful connection? Activity 3. The Poe Letters: What Can We Learn About Poe's Life? About Poe's Work? Reading authors' letters can give us information about and insight into their lives. But even when authors make direct statements about their work, readers have to be careful how they use the information for interpretation. Even personal letters are not absolutely reliable. People sometimes remember events incorrectly or fabricate to make themselves look better. However, Poe did confide in his "Muddy," Maria Clemm, the mother of his deceased wife. Letters are certainly helpful in documenting Poe's activities and state of mind shortly before his death. They could help eliminate some of the theories about his death that have been advanced; however, the question students should keep in the forefront of their minds is the extent to which such material can help readers understand Poe's work. Part I: What Can We Learn From the Letters About Poe's Life? The most commonly accepted theory of the cause of Poe's death has been the effects of alcohol. Having looked at the letters Poe wrote toward the end of his life, are students more or less inclined to believe that theory? Part II: Can We Make Connections Between Poe's Letters and his Work? If students are not already familiar with it, have them read (or read to them) "The Tell-Tale Heart," available on the EDSITEment resource American Studies at the University of Virginia. In it, the narrator denies that he is mad. What in the text belies that claim? How does something as craft-related as sentence structure (passages such as "I undid the lantern cautiously—oh, so cautiously—cautiously") reflect the apparent madness of the narrator? Next, share the letter Edgar Allan Poe to Maria Clemm, July 7, 1849 with the entire class. In it, Poe writes, "I was never really insane," sounding quite a bit like the narrator of his story. Does Poe's claim (as well as any other evidence in the letter) make the students think he was or was not insane? Is there any chance the narrator of "The Tell-Tale Heart" was never really insane? Now share with the class at least the opening sentence of the article "The Trial of James Wood." which is attributed to Poe, though not with certainty. Written in 1840, before the publication of "The Tell-Tale Heart," the article (regardless of its authorship) establishes that the insanity defense was used in the mid-19th century. Is it possible the narrator of "The Tell-Tale Heart" is relating the story to establish an insanity defense? Interested students will find the entire article quite intriguing, especially if Poe is the author. The class has discussed the story based solely on the text and in connection with a Poe letter and a contemporaneous news article. Do the students feel any approach was more valid (or enlightening) than another? Was any approach invalid? Is it best to cast a wide net and read all available materials, or does that take away from the power of the text itself? The article "Death Theories" on the website of the The Poe Museum of Richmond, a link from the EDSITEment resource American Studies at the University of Virginia, lists—and provides the sources for—15 different theories about Poe's death proposed over the years, including beating, epilepsy, diabetes, carbon monoxide poisoning, and even murder. Why so much interest? Poe is said to be perhaps the only author with whom virtually every American is familiar (a century and a half after his death!). Share with the class a work characteristic of Poe's grotesque tales such as "The Cask of Amontillado" or "The Tell-Tale Heart" Why do students think these stories have endured? Why are we less familiar with Poe's work that is not in the horror/mystery genre? Could it be because of our morbid fascination with Poe's life? Because Poe was so in touch with madness that he could write about it convincingly? Because people are simply drawn to good tales about the morbid side of life? Is there a connection between the morbid nature of Poe's most familiar work and the morbid fascination with his death? Does knowing something about Poe's struggles in life or the mystery of Poe's death make students feel any differently about his tales? Do they believe authors' lives should be studied to better understand their work? Students interested in the controversy over Poe's death can conduct further research on the issue. Some suggestions may be found in the first bulleted section under Extending the Lesson. Activity 5. How Did Poe Compose? Have the students read (or read to them) "The Raven," available from the Edgar Allan Poe Society, a link from the EDSITEment resource Internet Public Library. Then, share excerpts from Poe's "The Philosophy of Composition" on pages 3-5 of the PDF (see Preparation Instructions for download instructions). How does Poe claim he composed "The Raven?" Do students believe Poe when he describes how he created the piece? Does that knowledge change their reading of "The Raven?" Ambrose Bierce was also a master of the macabre and grotesque, and a similar controversy swirls around his death. Students who have read some of Bierce's work and who want to try out their newly practiced literary sleuthing abilities can, after getting some background, evaluate a purported account of Bierce's death. For background on Bierce, students should consult the Ambrose Bierce Chronology available on Don Swaim's The Ambrose Bierce Site, a link from the EDSITEment-reviewed website Internet Public Library. The website of the Ambrose Bierce Appreciation Society, also a link from Internet Public Library, features articles on The Life of Bierce and The Death of Bierce (see left-hand content links). Now students are ready to read California copy, by George F. Weeks - Part 32, CHAPTER XXXI, available from the collection California As I Saw It: First-Person Narratives of California's Early Years, 1849-1900 on the EDSITEment resource American Memory, and to make a judgment about its accuracy. Though much of the chapter is about Bierce, especially page 289, you can scroll or use the FIND function in the EDIT menu of your browser to locate especially relevant portions. Activity 7. Should Authors Be Anonymous? The contemporary author Salman Rushdie lived under a death threat for years because some people were offended by the content of his work. In support of another author faced with a similar reaction, Rushdie said, "Anyone who cares about literature should…at once defend the autonomy of the literary text, its right to be considered on its own terms, as if the author were as anonymous as, well, the authors of the sacred texts. And within a literary text, it must be possible to create characters of every sort. If novelists can't depict Nazis or bigots without being accused of being Nazis or bigots, then they can't do their work properly." Having looked at a variety of Poe material, do students now agree or disagree with Rushdie? Was any of the Poe material outside of the texts indispensable? Would we do better to keep authors anonymous and find meaning only in the texts themselves? Ask each student to formulate a written statement representing his/her stand on the issue. Students interested in the controversy over Poe's death can conduct further research on the issue. The website of the Poe Museum of Richmond, a link from the EDSITEment resource American Studies at the University of Virginia, provides background on the controversy as well as a list of 15 different theories in its article "Death Theories." A good college library in your area might have some of the sources listed there for reading about the various theories. The site Edgar Allan Poe's House of Usher, a link from the EDSITEment-reviewed website Internet Public Library, offers the article Did Poe Die from Rabies?. The Edgar Allan Poe Society of Baltimore, another link from Internet Public Library, offers a lengthy article on the subject entitled Poe's Death. The EDSITEment resource American Memory, in its collection The Nineteenth Century in Print: Periodicals, features Griswold's account of Poe's death in the article "Edgar Allan Poe" (The International Magazine of Literature, Art, and Science. Vol. 1, Issue 03A. October 1, 1850.). Griswold's account of Poe's death begins on Page 338 and ends on Page 339. Students interested in the problems with Poe's biographies can find Griswold's account of Poe's life in the article "Edgar Allan Poe" (The International Magazine of Literature, Art, and Science. Vol. 1, Issue 03A. October 1, 1850. ), beginning on Page 325 and ending on Page 344, available through The Nineteenth Century in Print: Periodicals collection of the EDSITEment-reviewed website American Memory. Students interested in reading more of the authors' works online can search for "Bierce" or "Poe" on the Books Collection of the EDSITEment resource Internet Public Library. Poe materials can also be found through the collection EDGAR ALLAN POE: Tales, Sketches and Selected Criticism on the EDSITEment-reviewed website American Studies at the University of Virginia. Interested students can read Poe's letters. The EDSITEment resource American Studies at the University of Virginia offers Poe Letters; and the website of the Edgar Allan Poe Society, available via a link from the EDSITEment resource Internet Public Library, features an extensive online collection of letters, along with information and links, at Poe's Letters. Did Poe Die from Rabies? "The Trial of James Wood"
Analyze primary and secondary sources to construct a biography and context for an author's writing. Identify text-based examples of craft, perspective, and other literary elements. Construct a position on whether materials outside of the texts, such as biographies and letters, should influence the way readers understand Poe's texts (and, by implication, any artist's work). What is the relationship between the narrators of literary compositions and their authors? How do we distinguish between biographical and other material interesting for its own sake and information that might provide insight into the work of Poe and Bierce? … someone is always between the reader and the action of the story. That someone is telling the story from his or her own point of view. This angle of vision, the point of view from which the people, events, and details of a story are viewed, is important to consider when reading a story." "There is a radical error, I think, in the usual mode of constructing a story … I prefer commencing with the consideration of an effect." —Edgar Allan Poe in "The Philosophy of Composition", Graham's Magazine, April 1846, pp. 163-167. (Bierce) is a most uncomfortable writer; so ravenous is his appetite for the horrible, and so keen his delight in keeping his readers' hair erect and their eyes bulging out of their sockets. Both Ambrose Bierce and Edgar Allan Poe wrote stories with—as Poe noted in "The Philosophy of Composition"—the "consideration of a novel effect … a vivid effect" on the reader as a central goal. One way to accomplish such an effect is by controlling, through the narration, the information available to the reader and the veracity of that information. The narrator of Poe's "Tell Tale Heart" assures us "how healthily—how calmly I can tell you the whole story," a statement later belied by the content and style of the tale. The narration in Bierce's "An Occurrence at Owl Creek Bridge" reveals at the last moment that the action in Part II took place only in the mind of the dying prisoner. Help your students consider a variety of narrative stances as they analyze how Bierce and Poe utilize narration in two stories. Note: This lesson may be taught either as a stand-alone lesson or as a prequel to the complementary EDSITEment lesson Edgar Allan Poe, Ambrose Bierce, and the Unreliable Biographers. Although designed for grades 9-12, many of the articles and resources in Edgar Allan Poe, Ambrose Bierce, and the Unreliable Biographers can be adapted for younger students as well. Download the worksheet for this lesson, available here as a PDF. Print out and make an appropriate number of copies of any handouts you plan to use in class. Both Poe and Bierce are best known for their stories of the macabre and grotesque, as represented by the four stories referenced in this lesson. Three of the tales ("An Occurrence at Owl Creek Bridge," "The Tell-Tale Heart," and "Masque of the Red Death,") are among the most frequently taught short stories; however, all of the narratives contain violence and may not be appropriate for every class. Second-person narration: Rarely used, but a viable alternative. Intrusive narration: In which the narrator judges the characters and comments on all their actions and motives. Impersonal narration: In which the narration appears strictly impartial even when omniscient. Free indirect discourse: In which the thoughts or speech patterns of a character are used without the use of first-person, as in "An Occurrence at Owl Creek Bridge," when the narration includes the following thoughts—obviously those of the condemned—without even using quotation marks: How slowly it appeared to move! What a sluggish stream! Activity 2 recommends the use of a directed reading and thinking activity. This method entails stopping the reading of a text at pre-selected intervals to ask students to predict what will happen and to support hypotheses with evidence from the text when possible. Because students are often reticent to participate if they are overly concerned about making a mistake, any prediction a student can support is accepted. When a "correct" answer is later determined through the reading, de-emphasize issues of right or wrong; the writer wants readers to muse about what will happen next and sometimes (especially with Bierce and Poe) intends to misdirect the audience. Because students should not read beyond the stopping point, you may have to prepare the text ahead of time. You might mark a handout to indicate stops, read the story aloud, or have the story read from an overhead or presentation system. In Activity 3, an exercise involving the short story "The Tell-Tale Heart" and a personal letter of Poe's is repeated in the complementary lesson Edgar Allan Poe and the Unreliable Biographies. Establish an anticipatory set by sharing with the class each of the following images from the EDSITEment-reviewed website American Memory. Present the images in turn, without revealing that they are photos of the Statue of Liberty until you show the last image. After you display each image, ask students to write down what they think they are seeing. In making an analogy between photography and narration, you will be asking students to consider the photographer as the narrator, the photograph as a moment in the narrative, and the photographic subject (i.e. the Statue) as the main character. 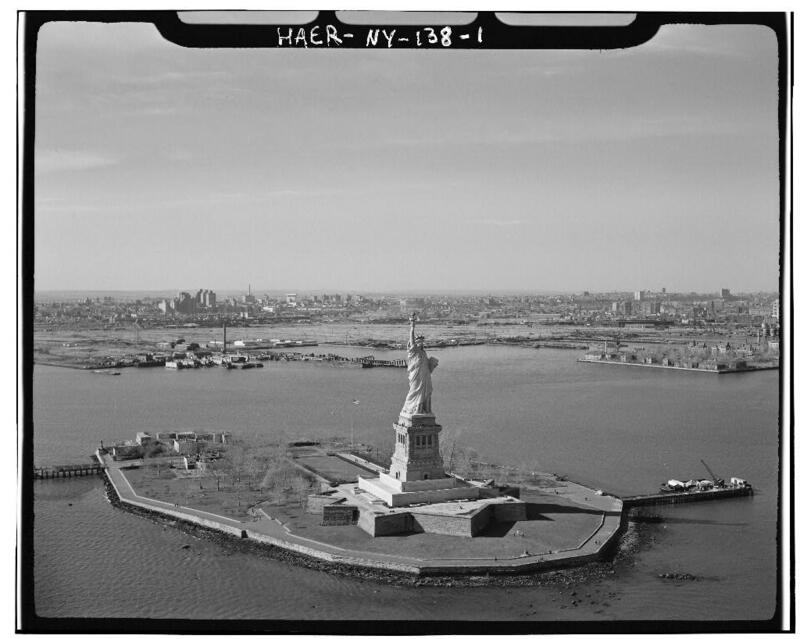 With this in mind, each of the photographs of the Statue of Liberty can represent one of the narrative stances discussed in the two-part lesson "Exploring Point of View" (Point of View and Types of Point of View) presented by the EDSITEment resource Learner.org. The Ringlet of Hair compares to the objective point of view, which is when the writer tells what happens without stating more than can be inferred from the story's action and dialogue. The narrator never discloses anything about what the characters think or feel, remaining a detached observer. In the photo, nothing can be inferred; it is even difficult to recognize the subject of the photo. The photographer/author has chosen, in this case, to create in the viewer/reader a sense of mystery or a desire to know more. Share with your students the information on "Objective Point of View" from Types of Point of View on Learner.org. The Nose Detail compares to third-person narration. Here the narrator does not participate in the action of the story as one of the characters, but lets us know exactly how the characters feel. We learn about the characters through this outside voice. 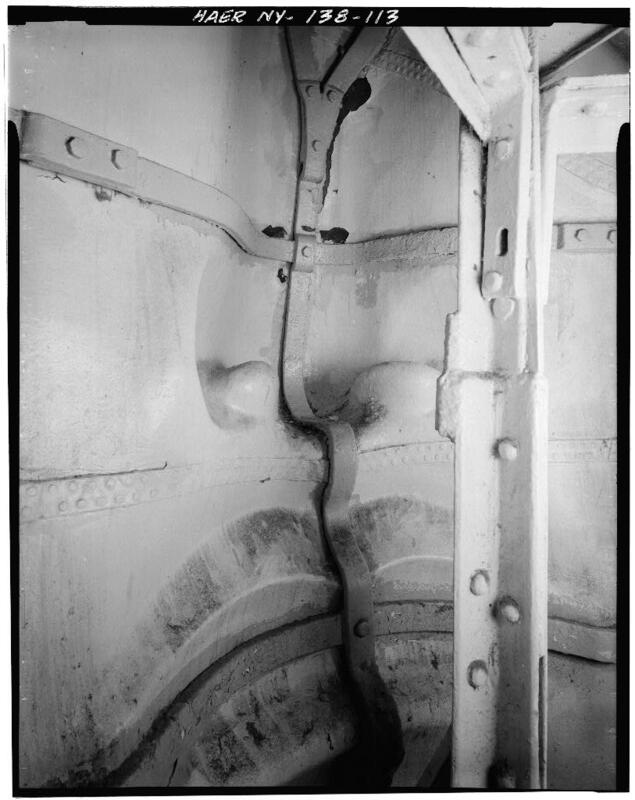 This photo shows a large sculpted nose that has incurred some damage. 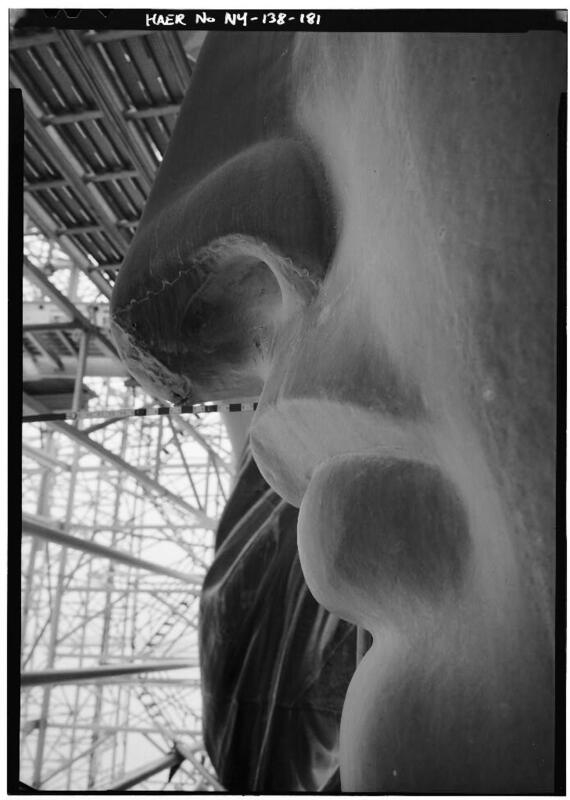 The viewer/reader can infer that this detail is part of a much larger, though unseen, statue that it is exposed to the elements, that it is aging; considering the statue as a character, the reader begins to learn how the character "feels" about the damage. Share with your students the information on "Third Person Point of View" from Types of Point of View on Learner.org. The View from the Torch compares to a first-person narrator—the statue itself. Here, we are looking out from the statue's point of view. Share with your students the information on "First Person Point of View" from Types of Point of View on Learner.org. Compare the Detail of nose and lips showing strap-iron armature supporting copper skin to the limited omniscient point of view, in which the narrator "knows" what's "inside" one character. Share with your students the information on "Limited Omniscient Point of View" from Types of Point of View on Learner.org. 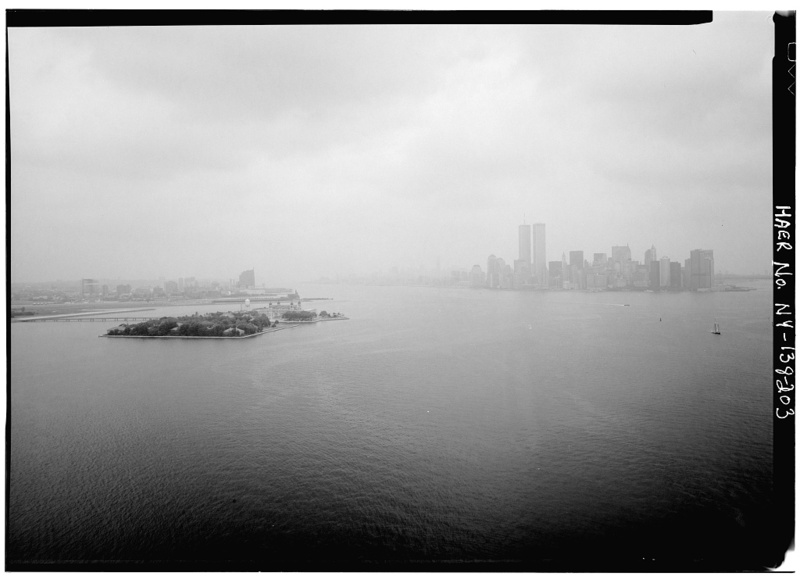 Compare the Overall view of Liberty Island looking Northwest with Jersey City in background to the omniscient point of view. Here the narrator sees everything and has all the answers we will receive in the story. Share with your students the information on "Omniscient Point of View" from Types of Point of View on Learner.org. 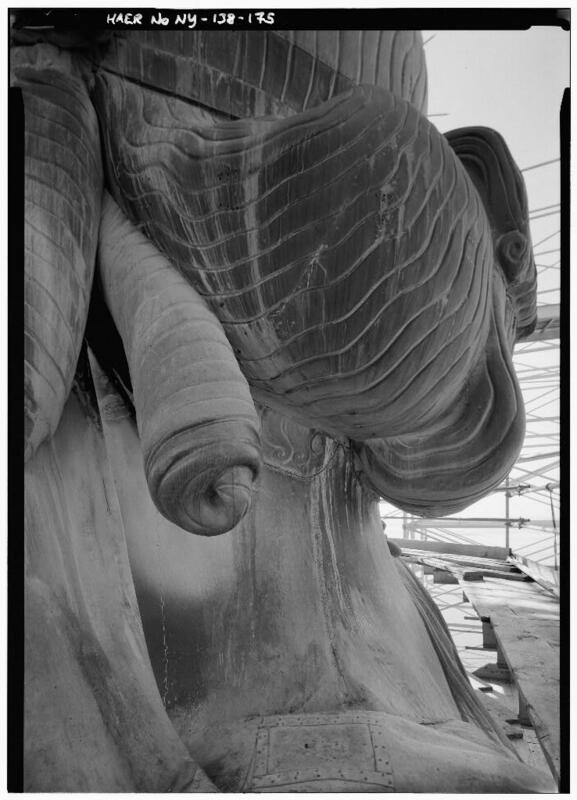 As in the poem The Blind Men and the Elephant, available on the EDSITEment resource Smithsonian American Art Museum, what you perceive in a narrative depends on what you are allowed to grasp. (If desired, share the poem with the class.) Through the narrator, the author controls the information available to the reader. Ambrose Bierce's "An Occurrence at Owl Creek Bridge", available at Project Gutenberg, a link from the EDSITEment-reviewed website American Studies at the University of Virginia, is a wonderful object lesson on the use of narrative, because Bierce subtly switches the point of view to achieve the desired effect on the reader. After the paragraph in Part I ending with "invader's farthest advance"
After the paragraph in Part II ending with "burn like tinder"
After the paragraph in Part III ending with "beneath his feet"
After the paragraph in Part III ending with "darkness and silence"
Once the reading is over, discuss the twist ending. Was it possible to "see it coming?" What point of view does the narration take for the final paragraph (objective)? We can understand to a great extent how Bierce fools the reader by noting the changing narration in the story as the author subtly shifts between points of view. Download, copy, and distribute to the class the handout "The Narration in Ambrose Bierce's 'An Occurrence at Owl Creek Bridge'" on pages 1–2 of the PDF. Give students time to work, either individually or in small groups, and then discuss what students determined. Always ask for support from the text. Be aware that there may be more than one way of looking at the narration. (For example, when the narrator reveals the visitor in Part II to be a Federal scout, is that omniscient?) If desired, display the story on an overhead or other presentation system and highlight the various sections with a color code for each type of narration cited. Hearken! and observe how healthily—how calmly I can tell you the whole story." —From Poe's "The Tell-Tale Heart"
I say to myself, in the first place, "Of the innumerable effects, or impressions, of which the heart, the intellect, or (more generally) the soul is susceptible, what one shall I, on the present occasion, select? Having chosen a novel, first, and secondly a vivid effect, I consider whether it can be best wrought by incident or tone—whether by ordinary incidents and peculiar tone, or the converse, or by peculiarity both of incident and tone—afterward looking about me (or rather within) for such combinations of event, or tone, as shall best aid me…"
—From Poe's "The Philosophy of Composition"
Now students are ready to look closely at two first-person narratives, Bierce's "My Favorite Murder," available via a link from the EDSITEment-reviewed website American Studies at the University of Virginia, and Poe's "The Tell-Tale Heart," offered in an exhibit of American Studies at the University of Virginia. Both are stories of murders from the point of view of the murderer. In both cases, the narrator/main character defends his behavior. As students read the stories, they should be thinking about to whom these defenses are directed. In "The Tell-Tale Heart," the reader appears to be addressed directly. Why would the narrator do so? The narrator denies that he is mad: what in the text belies that claim? How does sentence structure (passages such as "I undid the lantern cautiously—oh, so cautiously—cautiously") reflect the apparent madness of the narrator? Is the story then simply the ranting of a madman, who would speak to anyone? Share the letter Edgar Allan Poe to Maria Clemm - July 7, 1849, with the entire class. In it, Poe writes, "I was never really insane," sounding quite a bit like the narrator of his story. Does Poe's claim (as well as any other evidence in the letter) make students think he was or was not insane? Is there any chance the narrator of "The Tell-Tale Heart" is not insane? Can we equate the narrator of the story with Poe himself as both claim sanity, perhaps in hopes that they can will it so? Now share with the class at least the opening sentence of the article "The Trial of James Wood," which is attributed to Poe, though not with certainty. Written in 1840, before the publication of "The Tell-Tale Heart," the article (regardless of its authorship) establishes that the insanity defense was used in the mid-19th century. Is it possible the narrator of "The Tell-Tale Heart" is relating the story to establish an insanity defense? Interested students will find the entire article quite intriguing, especially if Poe is the author. All three possibilities above (the narrator is either stark raving mad, in a moment of (relative) clarity hoping against hope that he is not mad, or pretending to be mad) would preclude the possibility that we can completely rely on anything the narrator says. He is an example of an unreliable narrator. What in the text can students point to as likely examples of the narrator's unreliability? Likewise, "My Favorite Murder" is narrated by the perpetrator of a crime; in this case, however, the narrative is largely addressed directly to the judge after a short introductory section addressed to the reader. Why does Bierce have the narrator tell us as the story opens that his statement resulted in his acquittal? How would the effect of the story have been different had we not known until the end? Is it reasonable to believe the judge would recommend for immediate acquittal based on the artistry of the crime? Is it possible the judge recommended for acquittal on the basis of insanity? Could the entire tale be the ravings of a lunatic attempting to justify a horrible crime? What in the text can students point to as likely examples of the narrator's unreliability? Do students believe that the writer intended readers to regard the entire story as a kind of tall tale? If desired, direct students to complete the handout "Two First-Person Narrators" on pages 3-4 of the PDF, to facilitate a discussion of how the stories compare. If desired, give students the opportunity to experiment with narration. Let individuals take any story (or a story you assign)—"The Tell-Tale Heart" or even a familiar fairy tale would work well—and tell it from different points of view. Like Faulkner in The Sound and the Fury, each main character can re-tell the story. Or, students can relate the tale more than once using some of the narrative stances discussed in this lesson. Encourage volunteers to share their stories through reading or posting. Students interested in the controversy over Poe's death can conduct further research on the issue. The website of the Poe Museum of Richmond, a link from the EDSITEment resource American Studies at the University of Virginia, provides background on the controversy as well as a list of 15 different theories in its article “Death Theories.” A good college library in your area might have some of the sources listed there for reading about the various theories. The site Edgar Allan Poe's House of Usher, a link from the EDSITEment-reviewed website Internet Public Library, offers the article "Did Poe Die from Rabies?. "The Edgar Allan Poe Society of Richmond, another link from Internet Public Library, offers a lengthy article on the subject entitled "Poe's Death. "The EDSITEment resource American Memory, in its collection The Nineteenth Century in Print: Periodicals, features Griswold's account of Poe's death in the article "Edgar Allan Poe" (The International Magazine of Literature, Art, and Science. Vol. 1, Issue 03A. October 1, 1850). Griswold's account of Poe's death begins on Page 338 and ends on Page 339. Students interested in the problems with Poe's biographies can find Griswold's account of Poe's life in the article "Edgar Allan Poe" (The International Magazine of Literature, Art, and Science. Vol. 1, Issue 03A. October 1, 1850), beginning on Page 325 and ending on Page 344, available through The Nineteenth Century in Print: Periodicals collection of the EDSITEment-reviewed website American Memory. Edgar Allan Poe in "The Philosophy of Composition"
Contrast points of view in narrative text and explain how they affect the overall theme of the work. In the stories under consideration in this lesson, how did Ambrose Bierce and Edgar Allan Poe use narration to create their intended effect in the reader?